ST. LOUIS, Dec. 5, 2013 /PRNewswire/ — Brew Hub, a company led by a team of beer industry executives and craft brewing experts, has announced partnerships with three award-winning craft brewers: Cigar City Brewing; Orange Blossom Pilsner; and BJ’s Restaurants (Nasdaq: BJRI). Brew Hub will partner brew beer for all three companies at its new, state-of-the-art craft brewery in Lakeland, Fla. beginning May 2014. Brew Hub will brew a variety of beer brands for each company and distribute the beer throughout Florida and eventually other southeastern states. Partner brewing is a process that allows craft brewers not only to brew their beer to exact specifications under the supervision of their own brewmaster, but also to package and distribute from the Brew Hub brewery and make their beer available for export to international markets. Partner brewing allows craft breweries to expand their distribution without the overhead costs of building a new brewery or transporting beer across the country. Brew Hub also offers services including sales, marketing, logistics, compliance and government affairs. Brew Hub will brew approximately 40,000 barrels of beer for the three partners combined. 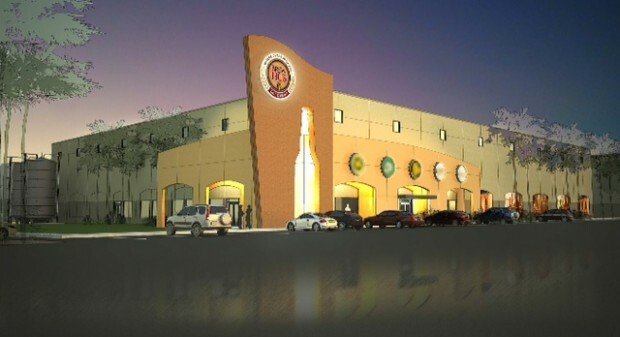 The Lakeland brewery will have an annual capacity of 75,000 barrels, or one million cases. The Florida brewery will be the first of five breweries Brew Hub plans to open across the country. All will allow craft brewers the opportunity to partner brew their beers on site. The Lakeland brewery is located in Interstate Commerce Park off the I-4 Corridor. The brewery will also feature a 3,000-square-foot tasting room where consumers can enjoy the beers being brewed by any of Brew Hub’s partners. The site’s central location will allow the company to efficiently distribute beer to wholesalers throughout Florida and the Southeast. Brew Hub brewing operations will be led by Chief Brewmaster, Dr. Paul Farnsworth, who is overseeing all aspects of design, layout, construction and day-to-day operation of the new brewing, production and warehouse facility in Lakeland, Florida. Farnsworth earned a bachelor’s degree and Ph.D. from the University of London and has been instrumental in the startup or operation of over 100 breweries in 10 countries. Brew Hub plans to open four additional breweries over the next five years. Specific markets will be determined based on demand, but the company is considering strategic locations in the Northeast, Mid-Atlantic, Midwest, Texas and West Coast. This network of Brew Hub facilities will allow craft brewers from across the country to enter new markets. Cigar City Brewing was founded with two goals in mind: first, to make the world’s best beer; second, to share with people near and far the fascinating culture and heritage of the Cigar City of Tampa. From its past as the world’s largest cigar producer to its Latin roots and the many other diverse cultures that call it home, Tampa draws on many sources to develop its unique culture. We use the highest quality ingredients we can lay our hands on, and that is not just marketing jargon. If it makes better beer, we use it. We also strive to use local ingredients when and where we can. Not only do fresh, local ingredients help us make better beer, it helps us make beer that reflects the culture and heritage of Tampa. Learn more at www.cigarcitybrewing.com. Orange Blossom Pilsner was first brewed in 2001 as one of Florida’s first craft beers, and the company has been brewing award-winning beer ever since. Orange Blossom Pilsner, made with orange blossom honey, is the company’s flagship brand, was awarded a bronze medal at the 2003 Great American Beer Festival. Today the company brews Orange Blossom Pilsner, Orange Blossom Squared and Toasted Coconut Porter and will begin releasing more fun, new beers in 2014. BJ’s Restaurants, Inc. currently owns and operates 144 casual dining restaurants under the BJ’s Restaurant & Brewery, BJ’s Restaurant & Brewhouse, BJ’s Pizza & Grill brand names BJ’s Restaurants offer an innovative and broad menu featuring award-winning, signature deep-dish pizza complemented with generously portioned salads, appetizers, sandwiches, soups, pastas, entrees and desserts, including the Pizookie dessert. Quality, flavor, value, moderate prices and sincere service remain distinct attributes to the BJ’s experience. The company operates several microbreweries in addition to using independent third-party brewers to produce and distribute BJ’s critically acclaimed proprietary craft beers throughout the chain. The company’s restaurants are located in California (63), Texas (29), Florida (15), Arizona (6), Colorado (5), Nevada (5), Washington (4), Ohio (4), Oklahoma (3), Oregon (3), Kentucky (2), Indiana (1), Kansas (1), Louisiana (1), New Mexico (1) and Virginia (1). Visit BJ’s Restaurants, Inc. on the web at www.bjsrestaurants.com.